A disease of newborns marked by fibrous obliteration of the extrahepatic biliary ducts. While the name implies that it is a congenital absence of the ducts, it is actually believed to be a progressive obliteration of the bile ducts near birth or during the first few weeks of life. Jaundice may be present at birth, but usually appears at 1-2 weeks of age. Biliary atresia occurs in 1 in 10,000 to 1 in 20,000 live births with a slight female predominance. There is not believed to to be a racial predilection in the United States. Biliary atresia may be associated with polysplenia syndrome. Polysplenia syndrome is: absent IVC (azygous drainage); bilobed, symmetric liver; preduodenal portal vein; abdominal heterotaxia; malrotation; bilobed lungs; cardiac defects. 10-20% of patients with biliary atresia have polysplenia syndrome. Without treatment, biliary atresia leads to cholestasis, and cirrhosis. Death typically occurs before 2 years of age. The prognosis is improved with early operation: Generally the patients undergo a Portoenterostomy (Kasai Procedure) as an infant. The surgery is successful in establishing bile flow in 70% of patients. Those that resolve their jaundice within the first 6 months of life are closely monitored for progression and liver failure. When the liver stops functioning adequately, they are referred for liver transplantation. In the 30% patients who do not resolve their jaundice after Kasai procedure, an early referral for liver transplant is made. The cause of biliary atresia remains unknown. Several theories exist, including: failure of recanalization of the bile ducts, vascular insufficiency, genetic factors, environmental teratogenesis, perinatal viral infection. The cluster of anomalies seen in polysplenia syndrome supports the hypothesis of defective early embryogenesis. Only one set of twins reported. We have taken care of a set of identical twins (one with, and one without biliary atresia, but both with congenital nephrotic syndrome). Schrieber reported on a common pathway in 1993 [Schrieber et al (J Pediatr Gastro Nutr 16:111, 1993)] which included an initial injury (toxic, viral, etc) lead to upregulation of biliary epithelium, with expression of new antigens. T-cells then mediated an inflammatory response resulting in fibrosclerotic reaction. Not true atresia – (not a failure to form). It is believed to be a progressive inflammatory disease. Patients have varying degrees of inflammatory infiltrates, scarring. Ductules are present in first month. 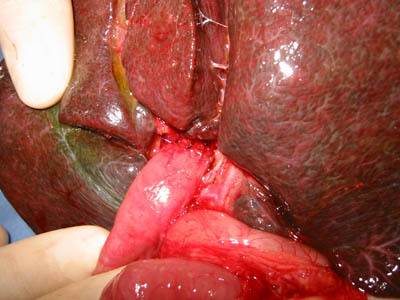 Initially liver is enlarged and cholestatic (green with unexcreted bile). Later it becomes hard and shrunken. 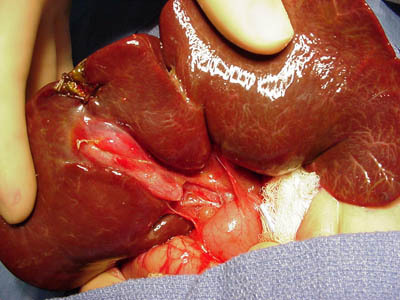 In contrast to neonatal hepatitis, the liver architecture is initially preserved. The histopathology on needle biopsy may overlap with neonatal hepatitis in 5-10% of cases with periportal fibrosis and bridging microscopically. Cirrhosis is seen later. Who gets workup for Biliary Atresia? Jaundice > 2 weeks warrants investigation with fraction of bilirubin, etc. Percutaneous liver biopsy (if diagnosis is unlikely) or open biopsy with Cholangiogram if highly suspicious. Serum bilirubin usually 6-12 mg/dl, 50-80% conjugated; Transaminases (ALT, AST) are 2 to 3x’s normal value. Alkaline phosphatase and gamma GGT levels elevated. TORCH titers are negative, hepatitis titers are negative. Normal alpha -1-antitrypsin studies. Gallbladder may be shrunken, but presence does not exclude biliary atresia. Also, ultrasound visualization of a common bile duct does not mean the bile duct is patent. Patients often have a fibrotic cord where the bile duct should be. Ultrasound evidence of polysplenia syndrome is highly suggestive of biliary atresia in the setting of acholic stools. Dilatation of bile ducts or presence of choledochal cysts also helps rule out biliary atresia. Nuclear Imaging (HIDA scan, or similar study) in biliary atresia will show hepatocyte uptake normal (if study done early in disease) with no excretion of the tracer into the bowel. Absence of gut excretion is not diagnostic â€“ False negatives = 67% of children with hepatitis syndromes in one study. Pretreatment for 4 or 5 days with Phenobarbital may decrease false positive tests. Wedge and/or tru-cut needle biopsy is also obtained if diagnosis unclear. Treatment of cessation of Bile Flow: Often associated with cholangitis: Antibiotics,methylprednisolone (controversial),choleretic, Reoperation is an option, but less common now with higher liver transplant survival. Systemic shunts are only used as a bridge to transplant and are much less common now. Esophageal banding of varices may prevent recurrent bleeds. Transplantation is preferred to shunting once the bleeding has been controlled. 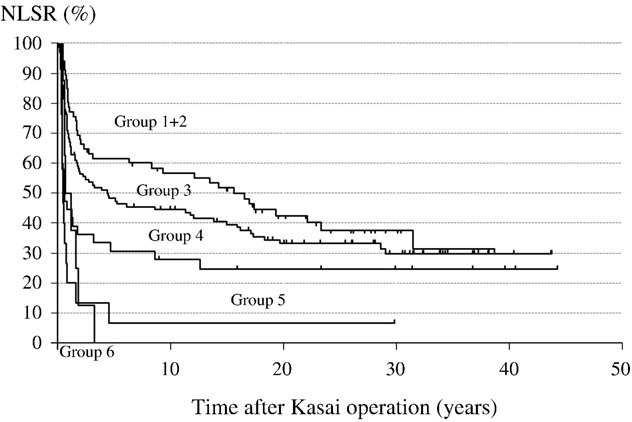 Impact of age at Kasai operation on short- and long-term outcomes of type III biliary atresia at a single institution. Nio, Sasaki, Wada, Kazama, Nishi, Tanaka. J of Ped Surg (2010) 45 2361-2363. NLSR = Native Liver Survival Rate (without transplant). The actual survival would be expected to be higher in the current era with successful liver transplant. Bile flow in 50-85% of infants Better bile flow in patients undergoing surgery at younger age (less than 6-8 weeks of age), but this may be due to a better prognosis for congenital forms of biliary atresia. Some centers have reported no difference in results based on timing of surgery if done at less than 4 months of age. Bilirubin < 1.0 by less than 2 months is best. 50% of these survivors, however, are jaundiced with portal hypertension. Nio, M., et al., Impact of age at Kasai operation on short- and long-term outcomes of type III biliary atresia at a single institution. J Pediatr Surg, 2010. 45(12): p. 2361-3. JOHNSON, K.N., C.S. KOONTZ, and R.R. RICKETTS, Role of Hepatic Portocholecystostomy (‘Gallbladder Kasai’™) in Treating Infants with Biliary Atresia. THE AMERICAN SURGEON, 2010. 76(August): p. 883.